I'm Awake: Feed Me Now! 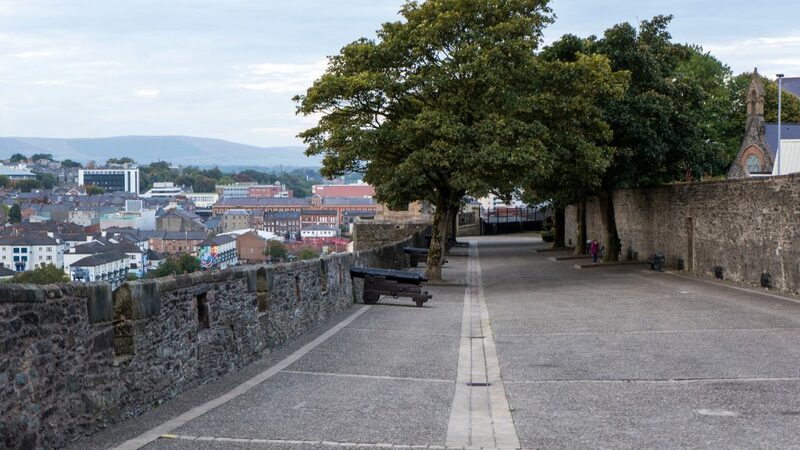 Every so often I have to travel to Derry as part of my job. 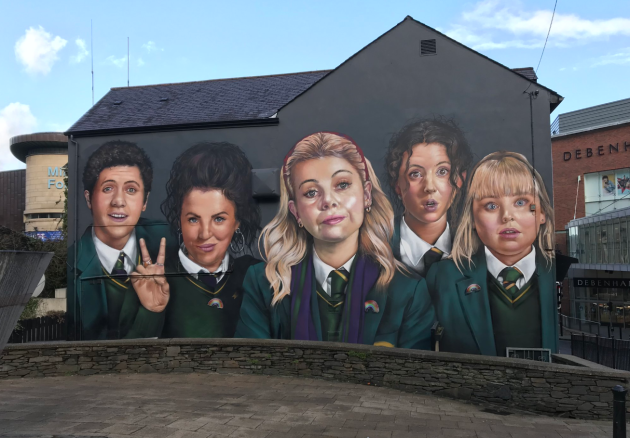 I love Derry. I love the people there. I love the accent. I love the sense of history (albeit troubled) that you get walking its walls. 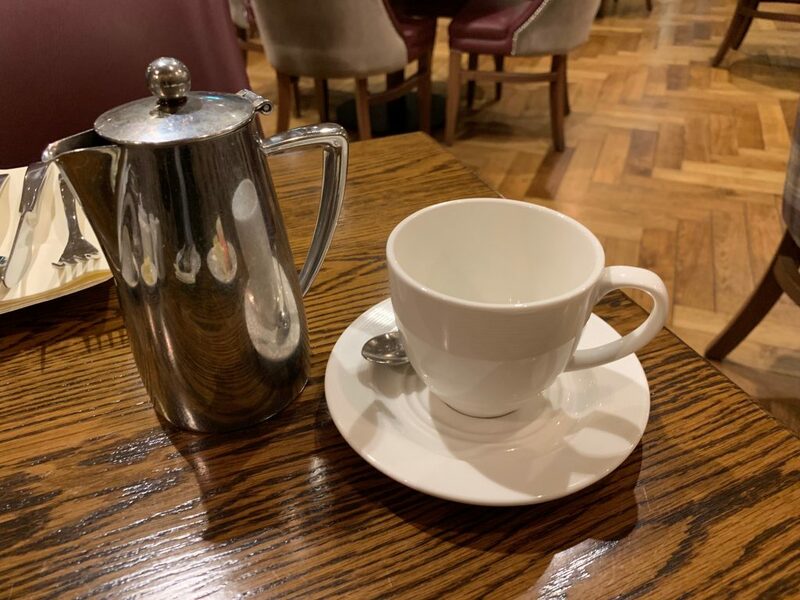 Over the years I’ve stayed in several of its hotels but more recently I’ve taken to staying in the Bishop’s Gate Hotel on Bishop Street, very close to the Diamond. 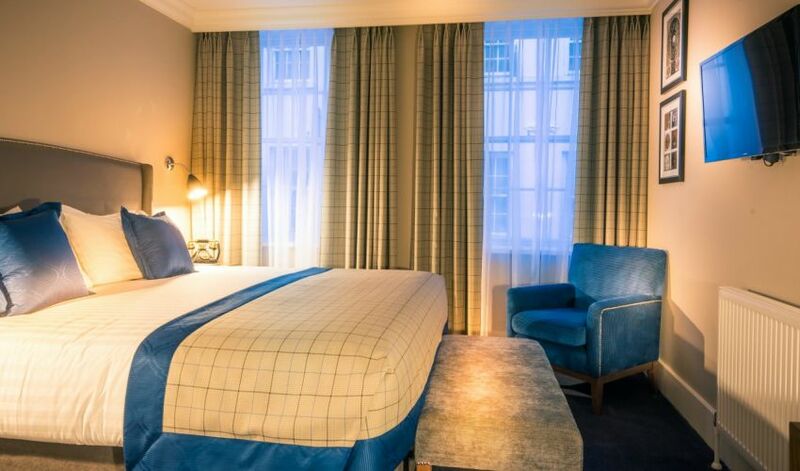 It calls itself a luxury boutique hotel and that’s what it is. The beds are big. And the bathrooms are clean and warm. Most importantly, it’s very friendly. Or, at least, its staff members are very friendly. And helpful, and they make one feel kind of special, and that makes me want to return. 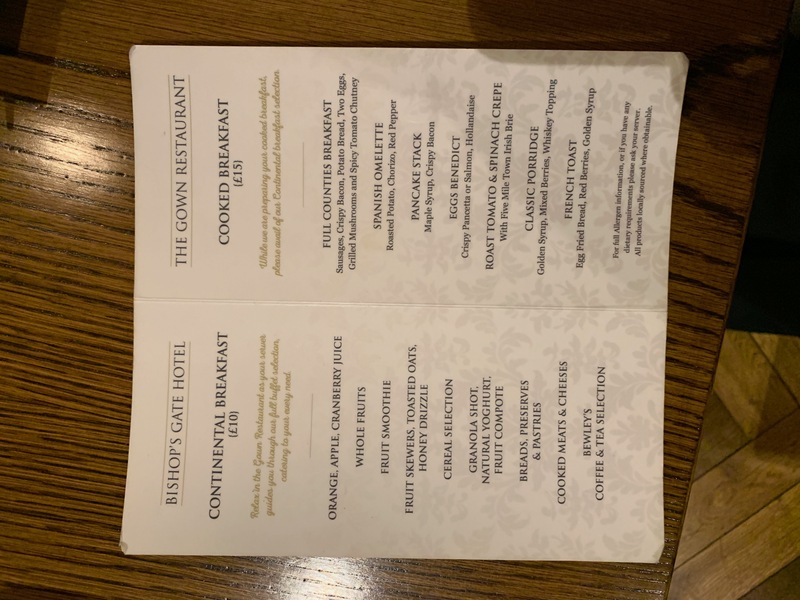 So, last week, I found myself in the Bishop’s Gate Hotel and I thought I’d include its breakfast in this blog. I was there for two nights. The first morning I didn’t take any photos but I had Eggs Benedict. They were nice, served on a brioche bun, with pancetta. To be honest, my mind was elsewhere, so I wasn’t focussed on the food. The next morning, though, I took some pics and put a bit more thought into what I was doing. 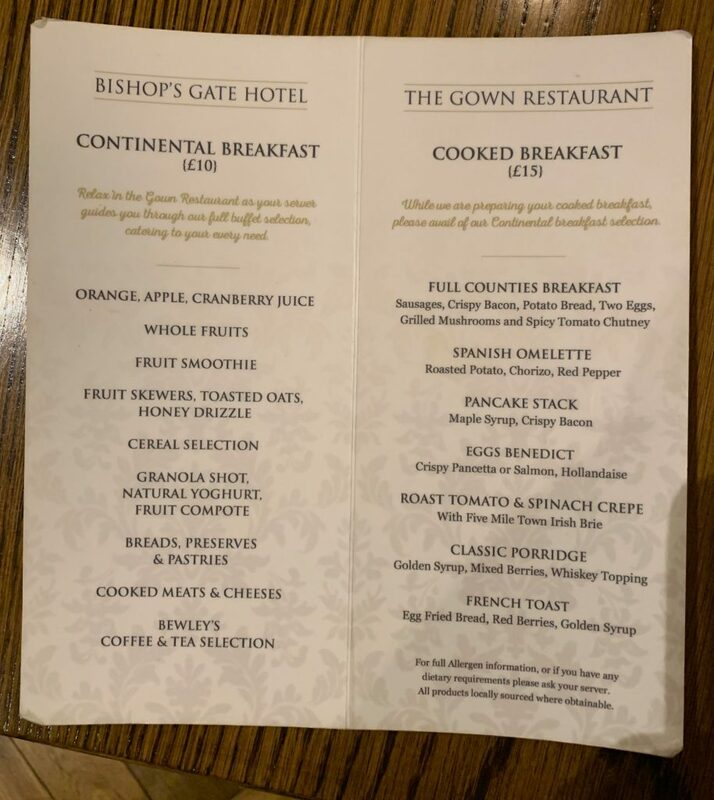 The Bishop’s Gate has two breakfast menus, like most hotels nowadays: a continental breakfast menu and a cooked breakfast menu. 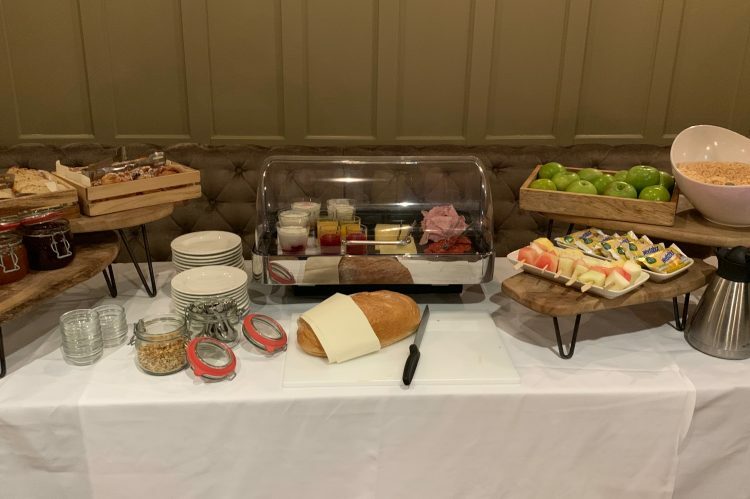 When you opt for the cooked breakfast, you get your pick of the buffet options as well as being able to order something hot. 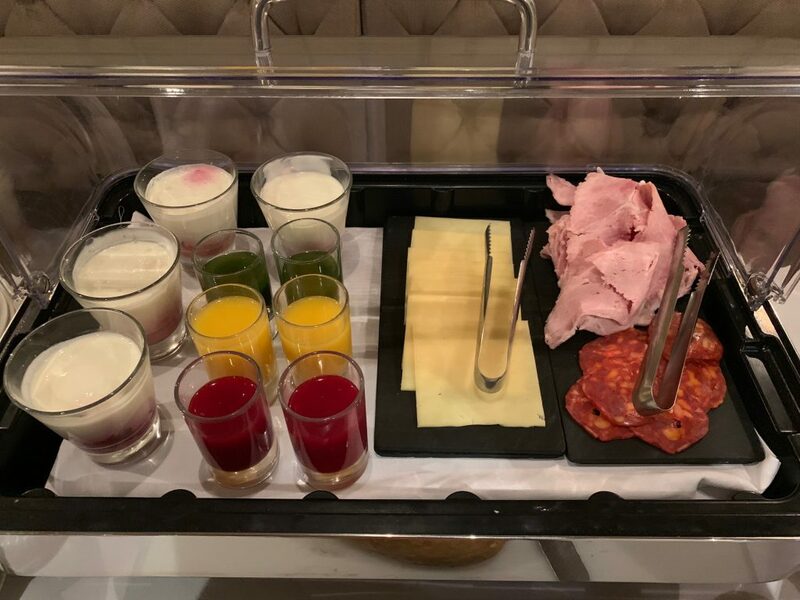 I was going to order a full breakfast, so I didn’t go mad with the buffet options. 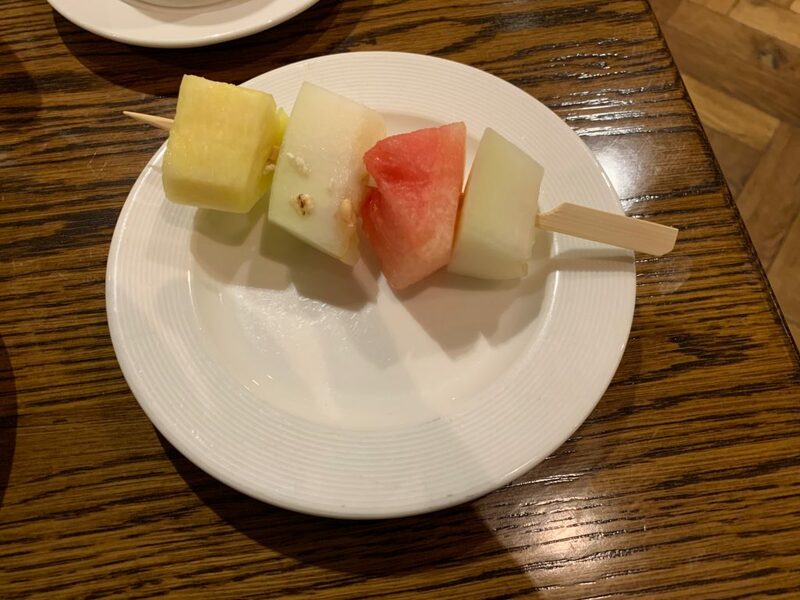 I just had what I’m going to call and melon and pineapple kebab (they call it a fruit skewer), and a small shot glass of a very dark green juice consisting of apple, mint and spinach. I consider that the combination of those two things serves as, at least, three of my five a day. 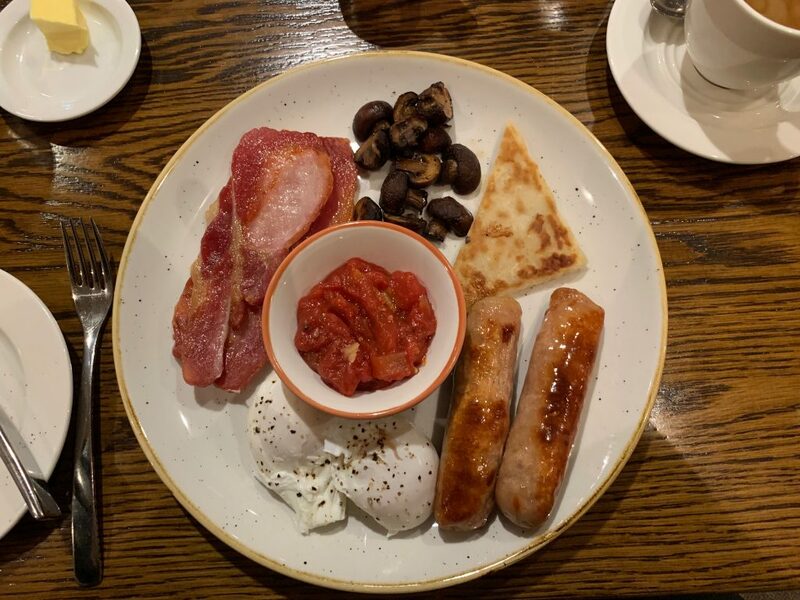 I made my order (Full Counties Breakfast with poached, rather than fried, eggs). My coffee and toast arrived pretty smartly. The menu refers to Bewley’s coffee and I suppose that’s what it was. It wasn’t the best coffee I’ve tasted but it was hot. Looks OK, doesn’t it? 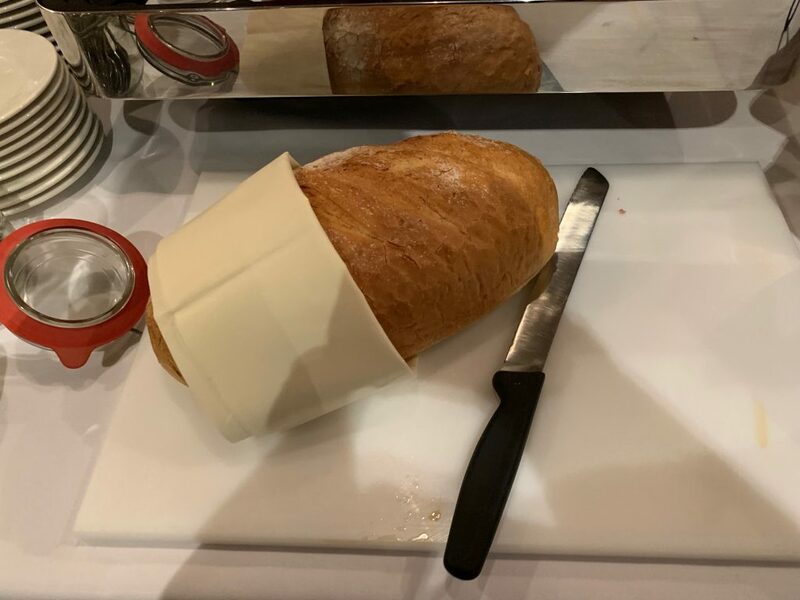 This hotel is good on presentation. I had dinner there the night before and it looked good too. So, bacon, sausages, eggs, mushrooms, a potato farl and a little bowl of relish. 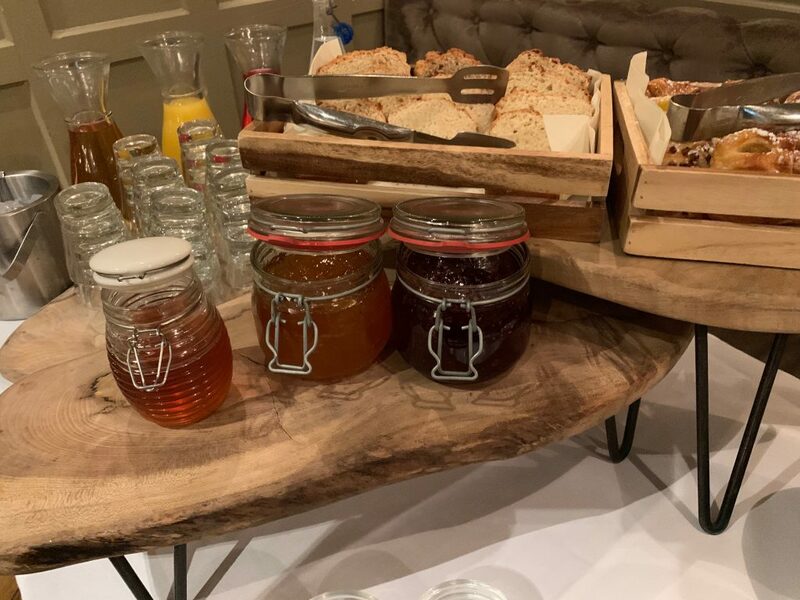 The relish is a nice touch. 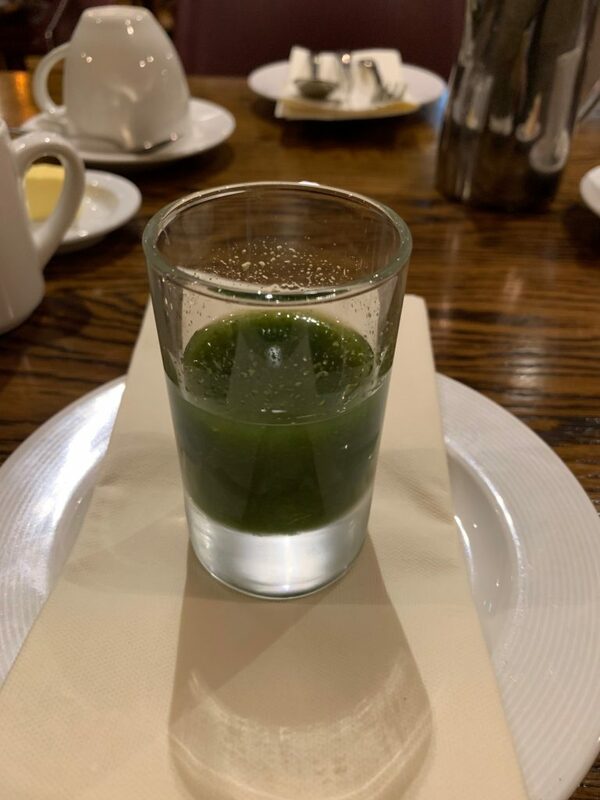 It added a little freshness to the meal which was welcome. 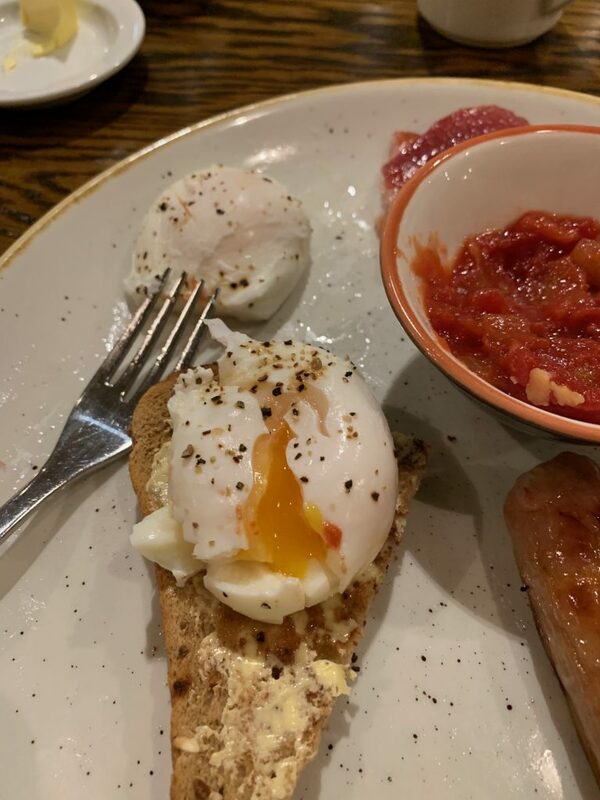 The eggs were decently cooked and I was glad I ordered poached eggs rather than fried eggs because when I’d finished, I didn’t have that residual greasy taste in my mouth that I get with a lot of fried breakfasts.. Everything else tasted as it should. 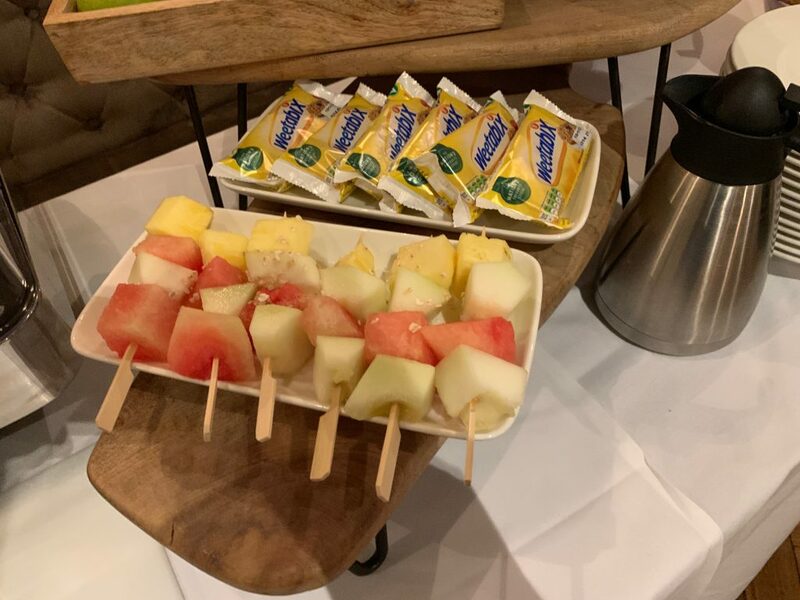 Nothing exceptional but a good solid hotel breakfast served by a cheery staff member. I felt well set up for the day ahead. 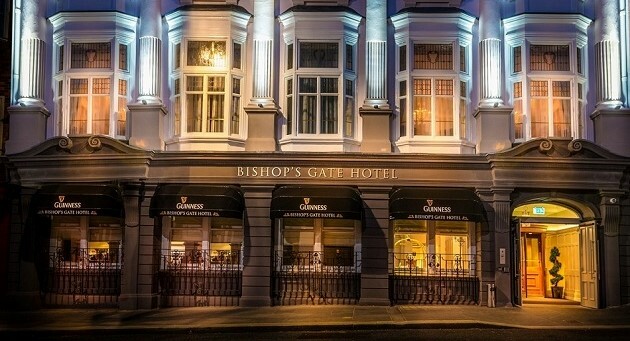 If you go to Derry, I do really recommend that you stay in the Bishop’s Gate Hotel. Oh, and visit the Tower Museum down the road near the Guildhall. My day job is to do with speech and drama. This is one of the poems I heard performed in Derry last week. It is an extraordinary poem written, and recited here, by an extraordinary woman. Another interesting review with good photos. When are you bringing me?